Minutes before the start, the four racers in the 1982 Great American Bike Race eagerly awaited the biggest challenge of their lives (photo above). They didn't know what to expect. No one did. This was the first non-stop bicycle race across the United States and the four men would race 2,876 miles from the Santa Monica Pier to the Empire State Building in New York City. All four competitors would finish. ABC Wide World of Sports would tell this story to millions of viewers. 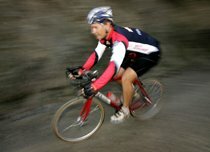 "Ultra cycling" became a new sport and the world as we know it was officially underway. 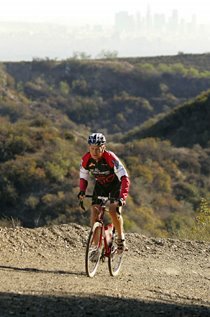 Within a year, legions of cyclists were inspired to become "ultra cyclists" and new races were created to develop the sport, including the John Marino Open, the predecessor to Furnace Creek 508. 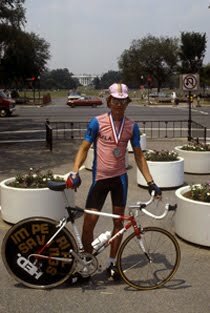 I began cycling in February of 1982, inspired by Sheldon Jackson, a schoolteacher colleague of my parents who had bicycle toured across America the previous summer. 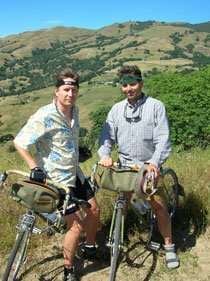 He had regaled us with his cycling stories shortly after my parents, brother, and I had returned from a one-year sabbatical involving 25,000 miles of road tripping through 20-some countries in Europe and Egypt. Having skipped the eighth grade to learn about the world up close and personal, I dreamed of seeing more of the world under my own power. Only 14 and therefore without a driver's license, my bicycle gave me the freedom to roam, and to head for any horizon which intrigued me. 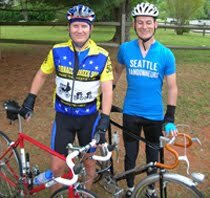 My first ride, the day after I bought my dream bike (a copy of Sheldon's), was 50 miles to Mt. Baldy and back from my hometown of Glendora, CA. I also subscribed to Bicycling Magazine and began reading about these four god-men who would be bicycle racing across America that summer. One day the phone rang and another of my parents’ colleagues, Wayne Hysen, wanted to know if I "had ever heard of Lon Haldeman." 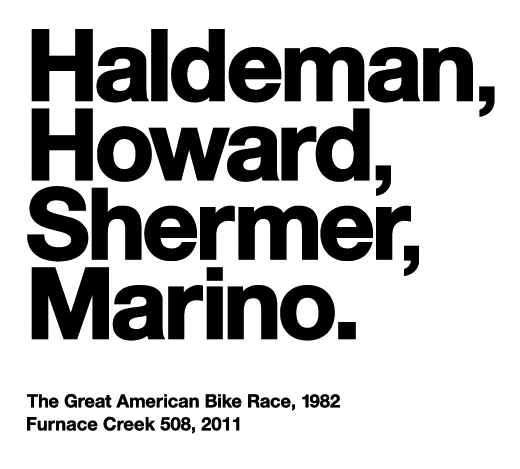 I had just read all about him and the other Great American Bike Race competitors - John Howard, Michael Shermer, and John Marino - so I answered in the affirmative. Wayne said, "Well, I'm from Illinois, so when I heard about Lon attempting this race across America, I invited him and his support team to base out of our house before the race in June. Do you want to meet him?" I sure did! 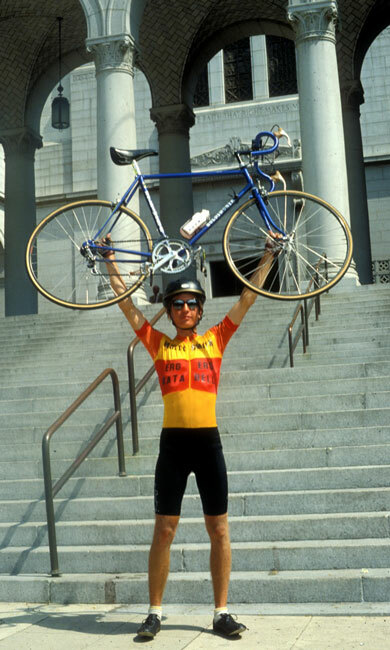 Standing in the foyer of the Hysens' home that August, I looked up at this towering giant of a man with dark brown tree trunk legs, asked him for his autograph, and told him I was going to do that bicycle race across America some day, "maybe when I'm 25!" That seemed so far away, such an "old age." I was only 15, and Lon, though he seemed like such a grown man to me, was just 23. Lon would win the race that summer and I was absolutely mesmerized by the TV coverage of the race. 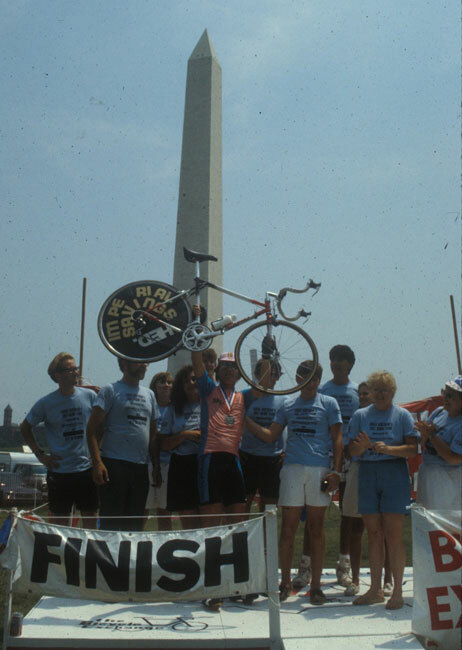 Lon would also win again, with the race rechristened "Race Across America," in 1983. 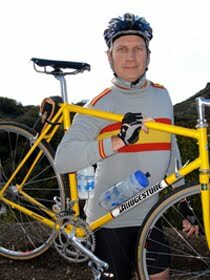 I had been there at the starting line that year, and had followed along - by car - for the first hundred miles or so. I knew I would do that race some day; there was no doubt. 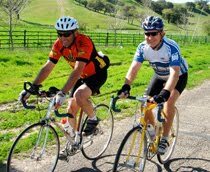 Cycling events were few and far between back then and most of us enthusiasts entered any cycling event we could find, whether a criterium, a century, a road race, a bicycle rally, a time trial, or one of those rare and illusive events which so few had ridden, a "double century." 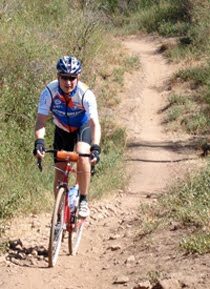 I'd ridden my first double at age 16 that year, still riding in racquetball shoes as I had not yet painted my parents' house to pay for my first pair of Sidi bike shoes. 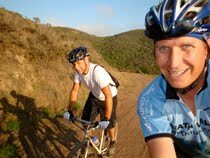 Now, somehow, I had come up with the idea of riding from San Francisco to Los Angeles, non-stop, against the clock, to set a record, and, more importantly, to become - like my idols - an ultra cyclist. 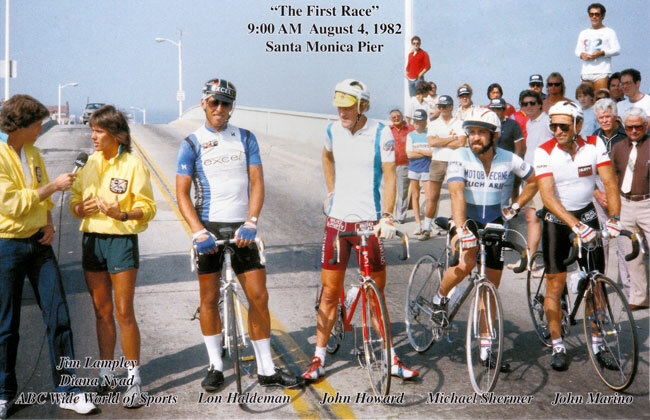 Columbus Day, 1983 I was in Santa Barbara to compete in a criterium. 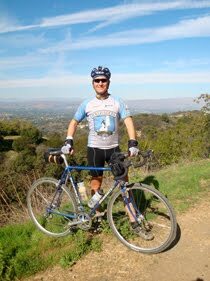 I saw John Marino across a parking lot, running a Race Across America booth at the event's bike expo. I literally sprinted across the lot to meet this living legend. He had come in fourth out of four in the inaugural race, but nobody had suffered more. And what's more, it was his vision which had created the race in the first place, the natural progression for a man who had thrice ridden against the clock - but against no other competitors - to challenge the Guinness World Record for trans-America riding. Twice he had been successful. With those efforts under his belt, he had created a race to provide others with the same opportunity to do what I much later came to describe as "exploring the inner and outer universes." 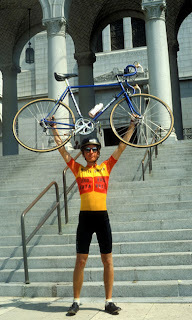 Photo of the skinny guy: That's me at LA City Hall, after riding there against the clock from SF in 1984. 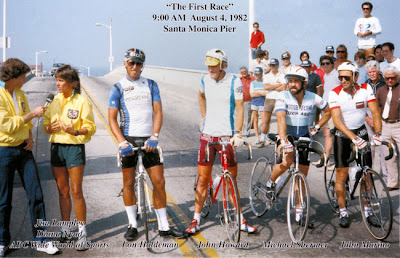 A year later, there I was, lining up at the start of the 1985 John Marino Open, just a few weeks before graduating from high school, and fresh off getting "my" SF-LA record back, with a time of 22 hours, 38 minutes over the 429-mile route. The top twelve at this "JMO" would qualify for the 1985 Race Across America. I managed to tie for 12th, moving from behind to ahead of much of the field by simply never giving up, something I had learned from watching the four founding fathers do so on television just three summers prior. I was getting ready to go off to college at U.C. 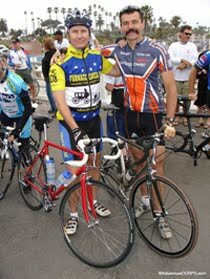 Berkeley, so racing across America was the furthest thing from my mind, but Marino invited me to join his Race Across America race staff. It would be my first road trip without my parents. I was just 18 and would have a front row seat to the dramatic, dark duel between Michael Secrest, the first new ultra superstar to challenge the founding four, and Jonathan Boyer, the first American to race in the Tour de France, a true pro cyclist trying his hand at this new type of bicycle racing. It was an absolutely pivotal nine days on the road and laid the final bricks in the foundation upon which my life, purpose, and career would be based. Within two years I would also be a finisher of the Race Across America, the youngest so far at age 20. My college studies in archaeology would continue, but there was no doubt I would be an entrepreneur with a focus on human potential and that I would continue to compete as an ultra athlete for a lifetime. 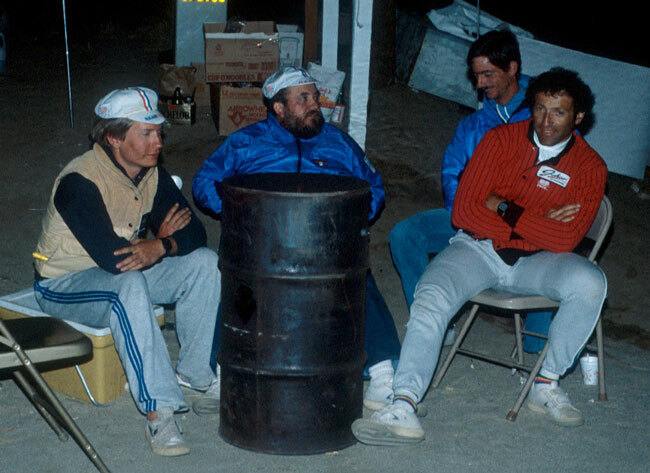 Photo: That's me with my amazing support crew at the finish of the 1987 Race Across America. I was 20 years old and on top of the world. This spring, 29 years after that original Great American Bike Race, I pitched Marino on the idea of the four founding fathers competing together as a four-man team in Furnace Creek 508, a race I have organized since he turned it over to me 21 years ago. Marino loved the idea and pitched it to Shermer. He figured he could just squeeze it into his schedule as the head of the Skeptics Society. Amazingly, Haldeman and Howard also both agreed. 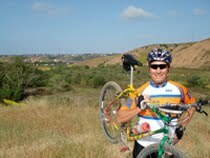 Lon would fly in for the race just hours after finishing leading one of his transcontinental PAC Tour events. 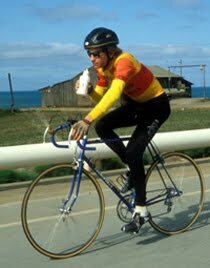 Howard would make it happen between coaching engagements and setting more national or world records in one form of competitive cycling or another. They've all been training like crazy and making plans via email and cell phone. It will be an absolute honor to share the roads with all 223 competitors in this year's race, along with all the support crews, and the absolutely amazing race staff. None of us would be here if it weren't for the vision, and pure sense of adventure, that Lon Haldeman, John Howard, Michael Shermer, and John Marino all displayed during the summer of 1982. After inspiring me on my own ultra path - as a competitor, as an event promoter, and as a human being - I am absolutely ecstatic to have them compete in this year's 508. I am equally humbled, for I can think of no greater tip of the hat for my idols to offer than to enter this race which I love so much and which they begat. 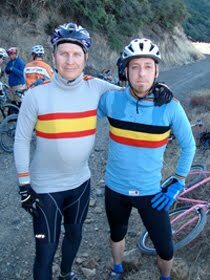 And for everyone in the race this year, I offer the solemn observation that you never know who YOU are going to inspire with your own efforts "out there" on the fabled Furnace Creek 508 race course. May we all roll so well and for so long as the founding four have done, and do. Life has come full circle. 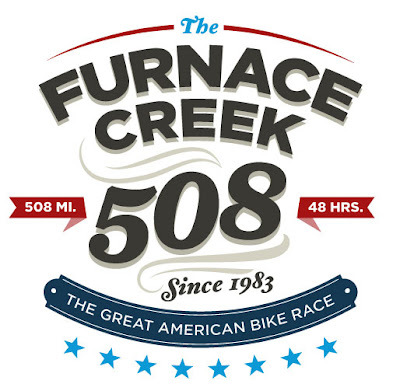 The 2011 Furnace Creek 508 Race Magazine includes over 35 pages of historic articles about the founding fathers and the original races from 1980, 1982, and 1983. It's a 13.7MB file, so it's very large and may take a few minutes to download. (508 entrants and staff will receive a printed copy of the entire 84-page, full-color magazine at Racer Check-In on Friday, October 7!) Download it here. Special thanks to Patsy Inouye, a fellow cyclist who is a librarian, for finding and sending me scans of many of the historic articles reprinted in the 2011 race magazine, as well as to two-time 508 finisher Bob Corman of Infinity Press for printing this special edition of the race magazine, and to Marcus Edvalson for creating the whole new suite of Furnace Creek 508 logos featured on and in this magazine, on the race website, and on the 2011 race gear and clothing. 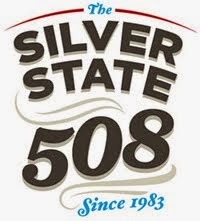 Special thanks also to Kevin Fung for his tremendous efforts in designing the 2011 Furnace Creek 508 Race Magazine. This was Kevin's biggest job yet for us and he pulled it off with aplomb! 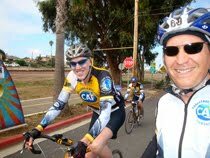 Clearly, the spirit of the Great American Bike race lives on in this great American bike race! 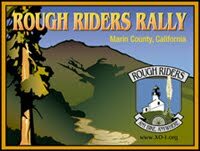 Follow all 223 competitors, including the Four Founding Fathers (AKA "Team Great American Toad"), as they participate in the 2011 Furnace Creek 508 via the live webcast on October 7-10, 2011 at this link. Really a nice story, Chris. 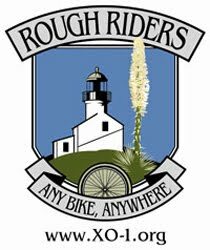 I knew about your ultra cycling events, but didn't know anything about the Race Across America.